“Slovakia: Little Tiger of Europe"
Rick and Robin Swenson with daughter Nora (AWS blue tie 2008) spent a year in Slovakia (formerly Czechoslovakia) in 2004. This gem of a country was behind the Iron curtain for nearly 3 decades. Rick, an AWS teacher for the past 25 years, had been awarded a one year Fulbright teacher exchange and traded places with a younger IB physics teacher. 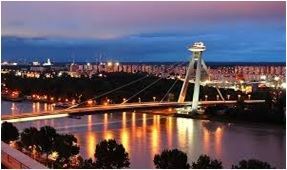 Their Slovakian experiences included many delightful opportunities as well as a few annoying challenges – both of which are to be expected during an international adventure. It’s called life! 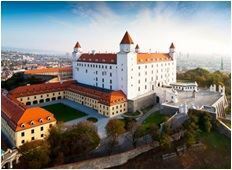 Slovakia has been called the Little Tiger of Europe. It is a wonderfully proud and industrious country, full of history, survivors and dreamers. Rick and Robin will try, with anecdotes and pictures, to share a little of its magic with you.